Wednesday we went over Echoboy and Crystallizer, two plugins from SoundToys. These plugins are really well designed and easy to use, but once again raise the issue of where sound design ends and the mix begins. I think the use of delays, echo and other plugins of this type can be effectively used in the sound design, composition phase but actually are more appropriate in the mixing phase. However, many times vocals are always reverbed, delayed or echoed to provide a certain tone or emotional coloring. At the same time these same plugins can be used to add "space", movement or emphasis to almost any part of the composition. For example, our instructor showed us how to setup a dual delay with very short delay times and a small offset for a bass line to add real depth and color. In the end its up to each of us to determine when and how to use these plugins and i suspect as with so much in music its a matter of practice and experiment. Level 2 will continue next week with more plugins. I missed Monday's class because I never got up after Sunday nights party, so going to talk a little about that, more to come on mixing tomorrow. My parties have often been a good reflection of where the neighborhood has been in it's journey into the 21st century. from the Ship Mast down on South 5th and Kent to Passenger Bar on Roebling and South 3rd is a longer journey than you might imagine. But its been a journey filled with great people and while many of them are gone, their memories linger in unexpected by ways of our community and my mind. It was a great time Sunday night and being with those folks who have been there since I first took a walk down Bedford was really inspirational, as were all those others there who have swum in the current along sides me on this journey. It gives me hope and determination to keep plugging away at my music and projections. While it was a great party, it also I feel indicates a certain ending, which of course means a new beginning, and hopefully what that is will be a lot clearer when its time for my next celebration. To all my friends and family, present or absent, I love you all very much, and intend to keep on moving forward.till I just cant move no more. On Wednesday, we continued with group mixing, this time in Ableton. It went really well, once again by using just a handful of plugins ( Alloy2, Decapitator) we were able to enhance the drums, leads, and vocals to really bring out the elements of the track. Its become really clear, that it's important to finish your production completely prior to working on the final mix. The technique of bouncing all your elements to separate WAV files and then mixing them is a useful way to separate your production work from your final mix. Seeing this in action over the last two classes really underscores the usefulness of this approach. Next week, we are moving on to some new plugins. Looking forward to it. Ariel encourages group mixing in order to emphasise the necessity for people skills as a critical part of the mixing process. It was definitely a challenge. Trying to get everyone working together, communicating about thnigs that are sometimes very abstract, is not easy. We were mixing my track and it felt good to get feedback and see the mix slowly evolve as we worked on the drums/bass, guitars, then synths and vocals using Alloy2 and Soundtoys Decapitator. Next class we continue with the group mixing exercise before moving on to more plugins. So far still really enjoying the class. Getting ready to record a live mix for Dubspot radio this afternoon. This will be my first birthday in 30 years where I am no longer a serf working for the pigs. The last 11 months have been the most liberating since I was in the White Panthers. Dedicating the rest of whatever time i have left to music is the most wonderful and terrifying experience I have had in years. It's all coming together and if you can drop by and share some of the love on SundayI would apprecatie it. Very strange coming back to the place I was born and raised. Nobody walks here people look kinda ill, dad's bakery gone, their house empty ready to be sold, mom living in a assisted living center. Walking around I'll don't feel much, stareing into the empty rooms I grew up in its been too long. But damm the French Toast at Murphys still tastes great as well as the sundaes at Friendlys. And my brothers and the kids are warm and wonderful. Gets down to it I don't regret a thing except for accidentally knocking that birds nest outside my window to the ground when I was 10. You can't go home again and really I don't want to. I want to live on Mars. Today was a fantastic class. Our Instructor Ariel, walked us through a complete mix of a project provided by one of our classmates. Luckily our classmate Daniel provided a great project to mix. This covered initial setup/cleanup of the stems and then a full on mix process. This was where all of the technical details, discussions and examples over the last few weeks were put into the context of doing a actual mix. What I got the most out of this was 1) you must have a solid production prior to mixing, you can't fix it in the mix, its purpose is to enhance and reveal the beauty and art of your production. 2) less is the best, loading up on plugins and effects is not a good strategy, minimal and good use of EQ, compression/limiting, one or two special plugins and reverb can really make a difference with most projects. He also showed us how to properly use returns, sends, busses and inserts. It was really a fascinating class and I'm looking forward to trying my hand at mixing in one of the next few classes under our instructors steady eye. It was really fun at Mixing class today. The course is a fascinating mixture of technical details, anecdotes and penatrating insights into the process of turning your ideas into finished tracks. The bulk of the class was on reverberation, specifically convolution reverberation which models actual rooms and structures which provide specific reflections/echoes based on a recording made in the room. Certainly reverb is one of the most common effects used in music production and mixing but I was surprised to learn that Rick Rubin ( one of the best producers around) doesn't use reverb on his tracks, on the other hand the Beach Boys Brian Wilson used it to great effect on many tracks. We spent an enjoyable time listening to various tracks to get a feel for the best use of reverb. Finally in lab we set up 4 specific reverbs; a small room, a reverb for snare, a plate reverb and a large room. By using these on kick drum, snare drum, lead and synthesizer we can get a much better handle on when and how much reverb to use. Wednesday our instructor will do a full mix of one of our projects. Really looking forward to this. So when you don't have a gig u are confronted with the need to be creative in the studio. Currently working on some new tracks a cover a remix and a original, focusing on sound design currently looking to get a unique sound for my kick and bass. Spent a few hours going over new house tracks for my dj set list now headphones on playing with synths. More to come. Today we began to really dig into mixing, utilizing Alloy2 EQs and the Decapacitor from SoundToys. But first we reviewed the importance of organizing your work flow so that you can immediately set to work on mixing your tracks without losing time because your DAW project is not organized. Having an instructor who knows the value of your time and has a solid workflow helps immeasurably when your working out your own. A key difference with this Mixing class is working with an instructor who is an active working engineer not a DJ/producer/musician as in most of the other courses. I don't think is realistic to assume you can fully take on mixing and mastering your projects after a 3 month course, but I do think that understanding the process, tools and the requirements that your mixing or mastering engineer need will by itself allow you to create good projects that can be improved by professionals. The key here is improved not repaired, as Ariel said today, you can't "fix it in the mix". The class usually allows for a "lab" time when you can work on your mix with the instructor available for questions, this really makes a huge difference and allows you to make sure you know your way around the various plugins. Finding new music and setting up sets is a big part of DJing. Personally I have a very refined aesthetic that I rely on to insure that my sets regardless of genre are consistent, positive, tuneful and beautiful. Typically I can go through 100s of songs to get 2 or 3 I feel comfortable using. As I get deeper into remixing, I am getting a much more concrete idea of what I want to share with people and how to re-arrange music to fit my vision. Over the last two years I Have had the pleasure of attending a number of DJ and music production courses at DubSpot NYC. 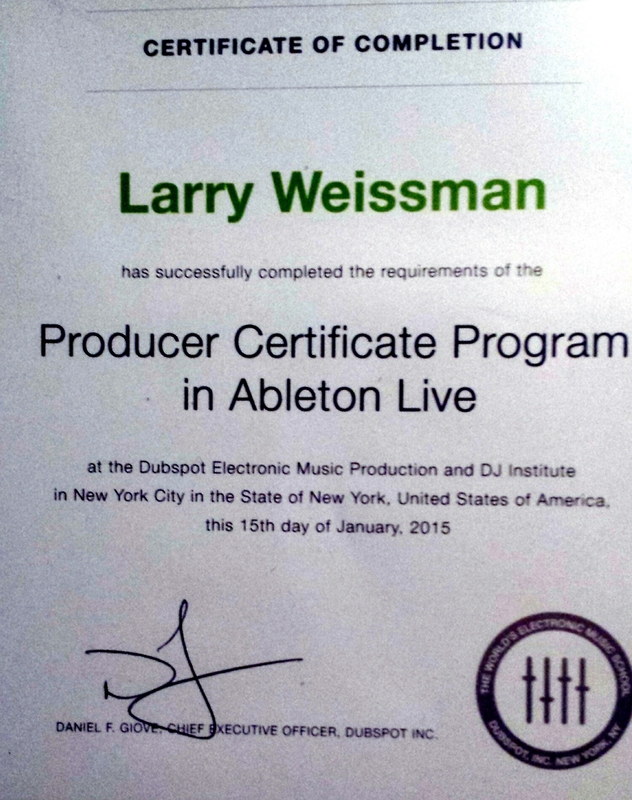 These included the DJ Intensive, Foundations of Dance Music and the Ableton Intensive. Thanks to the very kind and supportive folks at Dubspot, I am now attending the Mixing and Mastering course. In return for a scholarship, I have agreed to blog about my experiences at the school. This has spurred me to finally start blogging on a regular basis not only about Dubspot but also on my thoughts and experiences being involved with music over the last 5 plus decades. What makes Dubspot special is the people, they all without exception love music, understand collaboration and see their job as to encourage people to grow. Despite being much older than almost anyone there they have been unfailing in their support and encouragement. Mixing and Mastering is one of those next level areas of music production and my goal is to make sure I can produce excellent mixes that can be mastered to really showcase my creativity. I'm looking forward to the class which has about 8 people in it and is a good mix of producers, DJs, musicians. More to come on Wednesday. Please comment if you feel so moved. We will be filling the walls at Passenger bar with a number of the best psychotronic films from my collection including A Wakening Of The Beast (1969), Beyond the Time Barrier (1960), Tribulation 99 (2006) and Naked Lunch (1991. In addition a full on brand new dance set hip-hop to trip-hop, rock to house and much more. 10 till 4 no cover Passenger bar 229 Roebling. It's been a while ( almost 5 years) since I threw a Caterpillar Party but today's post Juno chilled out atmosphere is perfect for a psychotronic salon. Bree will be slinging the libations while I project classic psychotronic films from my collection and play music designed to liberate your Caterpillar souls. Can't think of a better location then Billet & Bellows 177 Grand in Williamsburg for the party. 9:30 till 2:00. Get there early if you want to insure you get your Caterpillar on.